Social media is a great strategic channel to communicate with customers. Unfortunately, most organizations are unaware of the average time elapsed between the detection of a potential social media threat to their brand reputation, and sharing this knowledge with the appropriate colleague(s) to mitigate it. 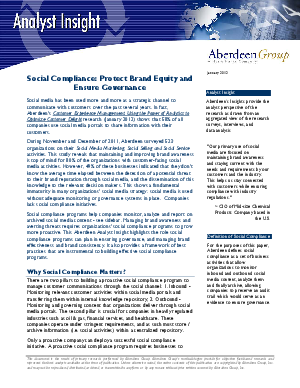 Social compliance programs help companies monitor, analyze and report on archived social media content. Managing brand awareness and averting threats requires organizations' social compliance programs to grow more proactive.